The Best Pennsylvania Blogs from thousands of Pennsylvania blogs on the web using search and social metrics. Subscribe to these websites because they are actively working to educate, inspire, and empower their readers with frequent updates and high-quality information. Also check out Pennsylvania Youtube Channels. Pennsylvania newsletter is a comprehensive summary of the day's most important blog posts and news articles from the best Pennsylvania websites on the web, and delivered to your email inbox each morning. To subscribe, simply provide us with your email address. Allentown, PA About Blog Subscribe us to get the latest news, updates about what's happening in Pennsylvania from The Morning Call. Facebook fans 81,136. Twitter followers 82,919. Harrisburg, PA About Blog I've traveled to all 67 counties in Pennsylvania, and I'm sharing the best things to see and do around the state. Get your PA travel advice from someone who's actually been there. Come along as I uncover PA! Facebook fans 76,214. Twitter followers 2,263. Pittsburgh, PA About Blog TribLIVE provides local news, sports, politics, entertainment and more in the Greater Pittsburgh Area in Pennsylvania. Facebook fans 73,902. Twitter followers 69,380. Scranton, PA About Blog We're all about what's going on in Northeast Pennsylvania. Follow us for a daily recap of event highlights and timely arts & entertainment news. Facebook fans 5,069. Twitter followers 8,402. Pittsburgh, PA About Blog Hi There! Thanks for stopping by! My name is Carly Luitgaarden and I am from Pittsburgh Pennsylvania. Flawless, Darling is a fashion and lifestyle blog where I can truly be myself. This blog is is here to give you the inspiration you need to look Flawless, Darling! Facebook fans 352. Twitter followers 4. Philadelphia About Blog Eater Philly features articles about food news and dining guides for Philadelphia, PA.
Facebook fans 14,717. Twitter followers 22,794. Pennsylvania About Blog Welcome to the Pennsylvania Family Law Blog! We have developed this blog and look forward to providing insights into the law, updates of the law, and general information regarding Family Law Issues in Pennsylvania. Facebook fans 102,932. Twitter followers 4,332. Philadelphia, PA About Blog The Motherchic, a parenting, lifestyle and fashion blog, is the headquarters for all things parenting and fashion. Here you'll get real mom reflections on parenting and simple ways to update the mom uniform with accessible, affordable fashion trends. Facebook fans 388,066. Twitter followers 858. King of Prussia, PA About Blog CMG Capital Management Group is a leader in tactical strategies for advisors. Facebook fans n/a. Twitter followers 766. Harrisburg, PA About Blog Get the latest breaking Pennsylvania political news from Harrisburg to DC. Governor, U.S. Senate, Congress, state Senate & House, and more. Facebook fans 8,051. Twitter followers 11,159. Facebook fans 30,255. Twitter followers 4,686. Facebook fans 2,918. Twitter followers 1,262. Harrisburg, PA About Blog Humane Pennsylvania and its partner organizations chose to come together to form a humane community now. By working together, Humane Pennsylvania delivers veterinary services to tens of thousands of clients; provides preventative and emergency services which keep thousands of animals safe and sound in their homes; and rescues, houses, and treats thousands of homeless pets. Facebook fans 1,999. Twitter followers n/a. Philadelphia, PA About Blog The Pennsylvania Gazette is the University of Pennsylvania's alumni magazine. The recipient of numerous awards for writing and design, the Gazette presents thought-provoking articles and information about the University campus along with alumni notes and comment. Written for, about, and frequently by, alumni, the Gazette's viewpoint is as wide-ranging as the readership it serves and is committed to reinforcing the richness and diversity of the Penn experience. Facebook fans 999. Twitter followers 2,339. Harrisburg, PA About Blog We are Pennsylvania's voice for families - protecting life, marriage and religious freedom. The Mission of the Pennsylvania Family Institute is to strengthen families by restoring to public life the traditional, foundational principles and values essential for the well-being of society. Facebook fans 5,956. Twitter followers 578. Harrisburg, Pa About Blog The PA Historical & Museum Commission is the official history agency of the Commonwealth of Pennsylvania. The role of the PA SHPO is to identify and protect the architectural and archaeological resources of Pennsylvania. Facebook fans 84,267. Twitter followers 4,978. Pennsylvania About Blog Explore spectacular wild landscapes, journeys and outdoor recreation across two million acres of land with stunning natural views - welcome to your PA Wilds! Facebook fans 16,242. Twitter followers 2,562. About Blog The McNees Labor & Employment Blog seeks to provide employers with operations in Pennsylvania with the latest updates, analysis, and commentary on how the law impacts employers at the national, state, and local level. Our attorneys in Harrisburg, Lancaster, Scranton, State College, and Columbus, Ohio cover topics including employment litigation, wage & hour issues, unions, social media, discrimination & harassment, employee benefits, and affirmative action. Facebook fans 446. Twitter followers n/a. PA About Blog We are the Blizzards, a husband & wife wedding photography team located just outside of Philly, PA! We love photographing engagements and weddings! It makes our little photographer hearts so happy! Facebook fans 2,371. Twitter followers 209. Pennsylvania About Blog The Section of Archaeology at The State Museum of Pennsylvania curates the largest collection in the museum and is responsible for multiple functions within the PHMC. Developing and maintaining exhibits in the Hall of Anthropology and Archaeology is a primary function, but our role as the state repository for cultural resource projects is substantial. Pennsylvania About Blog Hunger-Free Pennsylvania works to end hunger and food insecurity in collaboration with a diverse group of organizations and individuals dedicated to ensuring that all Pennsylvanians have consistent access to nutritious food. Pennsylvania About Blog Trailheads is a behind the scenes look at the historic sites and museums along Pennsylvania's Trails of History. Pennsylvania About Blog Have you done your part to support the Building of The Wall? Support Today by joining the movement and showing your awareness for the security of our children purchasing the original build the wall movement hat. Harrisburg, PA About Blog Open Records in Pennsylvania is a blog about the right-to-know law and other issues related to government transparency by Erik Arneson. Facebook fans n/a. Twitter followers 1,421. About Blog Spot On Pennsylvania is the smart news aggregation website that provides an overview of news articles collected from various, curated news outlets. Facebook fans 33. Twitter followers 4. Pennsylvania About Blog We are a Pennsylvania-based sustainable agriculture association founded in 1992. We work to build a more economically-just, environmentally-regenerative, and community-focused food system through education and research that directly supports farmers. Facebook fans 10,309. Twitter followers 2,878. Central PA About Blog ABCs and Garden Peas is a food and lifestyle blog by Wendy featuring articles about real food, family, PA travel and entertainment. Facebook fans 5,235. Twitter followers 17,108. About Blog Hi! I'm Vicky, a South Florida-based blogger traveling around the world with my stuffed monkey Buddy. Follow to know more about where to go, what to do in Pennsylvania. Facebook fans 2,369. Twitter followers 28,589. Harrisburg, PA About Blog Your official guide to exploring Harrisburg, PA. From events to restaurants there is plenty to discover. Facebook fans 1,725. Twitter followers 465. About Blog Around the World "L" is a travel and lifestyle blog featuring travel advice, insights on culture and education around the world and more. Subscribe us to get articles about travel stories of Pennsylvania. Facebook fans 3,483. Twitter followers 20,372. About Blog The Pennsylvania Legal Blog features news and commentary about matters impacting the Pennsylvania legal community. Subscribe us to get summaries of Pennsylvania appellate, trial court decisions, and rule changes. 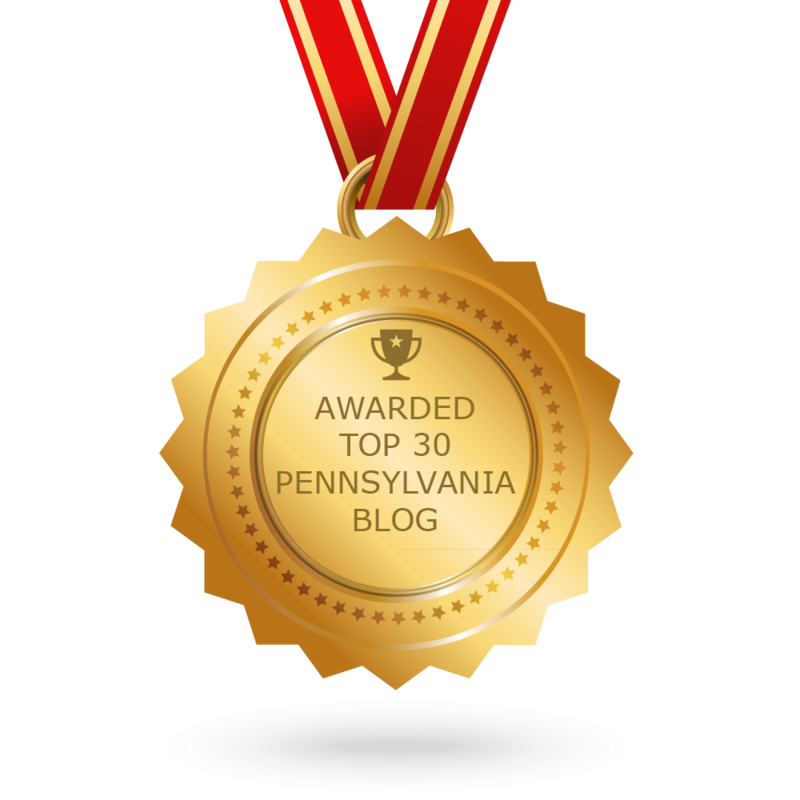 CONGRATULATIONS to every blogger that has made this Top Pennsylvania Blogs list! This is the most comprehensive list of best Pennsylvania blogs on the internet and I’m honoured to have you as part of this! I personally give you a high-five and want to thank you for your contribution to this world.